Maintain a healthy start to each day even in an emergency with 4 different hearty breakfasts. This 120 serving bucket is a great addition to your emergency preparedness food supply. The most important meal of the day just got an emergency makeover, thanks to Legacy Premium’s breakfast bucket. Imagine 120 hot breakfast meals, ready the instant you want them but freeze-dried and stored to last up to twenty-five years. Breakfast bucket includes four different breakfast options. Picture old-fashioned pancakes, strawberry creamy wheat, multi-grain cereal or oatmeal with brown sugar. 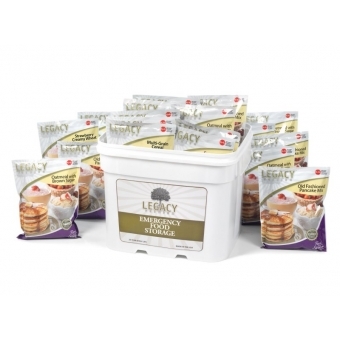 Indulge in satisfying breakfasts to get you ready for the day with Legacy’s emergency freeze-dried meals. Legacy Premium ready-made meals are the best solution for establishing and living off your freeze dried emergency food supply. Breakfasts and other meals are ready with little prep time and provide a tasty treat regardless of your emergency. Legacy freeze dried meals are the lowest cost in the emergency-ready market. Freeze dried meals and breakfasts are sealed in Mylar pouches. Each pouch has an oxygen absorber and nitrogen flush in it to keep residual oxygen levels down and to prolong shelf life. Legacy breakfasts are so good you won’t want to wait for an emergency to enjoy them. Get ready to spoil yourself and your family with four delicious breakfast options: strawberry creamy wheat, old-fashioned pancakes, multi-grain cereal and oatmeal with brown sugar. 120 freeze dried breakfasts/meals from Legacy will help cover your family’s nutritional needs and start the day off right. Get ready for an emergency now. Should an emergency occur, keep up family resolve with enjoyable Legacy Premium freeze-dried meals. Studies show that the more filling your breakfast is, the fewer calories you will need throughout the day. Legacy freeze dried breakfasts are hearty, great-tasting and ready in an instant. Arm yourself with wholesome, quality emergency meals that will keep your family healthy and strong. Freeze dried meals are stored in heavy-duty buckets that can be opened and resealed without affecting shelf life.